What might Vigilance sound like? Where does Anger end and Rage begin? How can Surprise become Amazement? 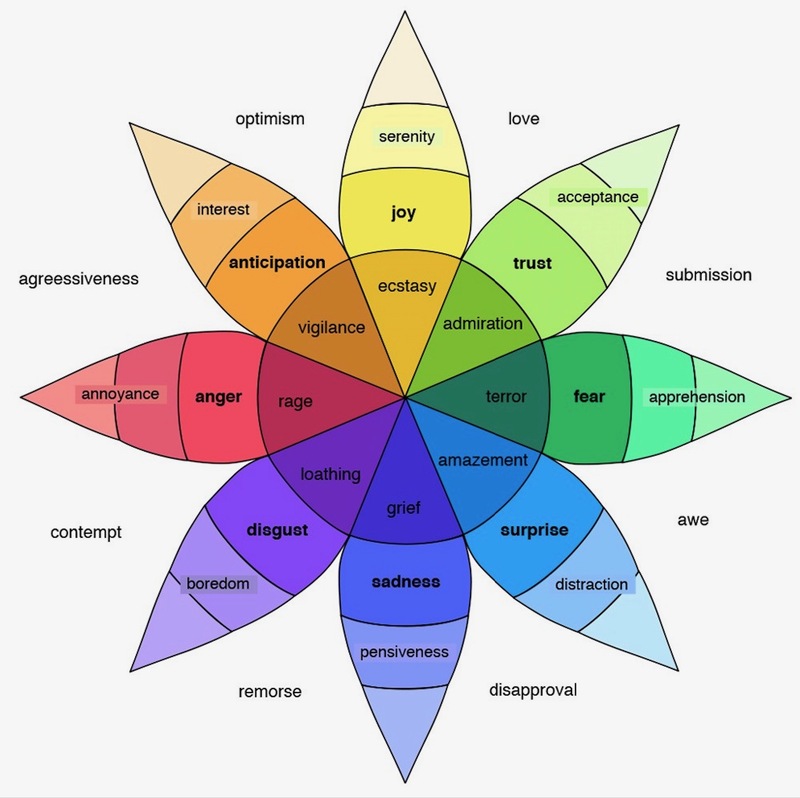 Why is emotion important at all? 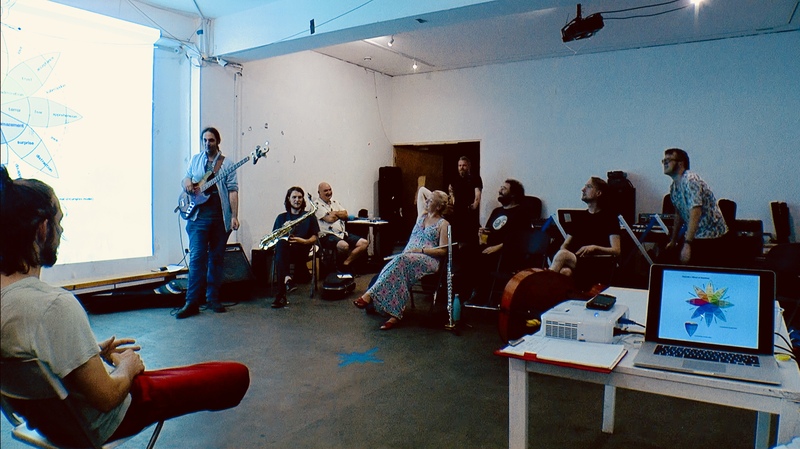 I am Just a Little Emotional is a workshop which analyses emotion state theories and how we can exploit these in composition and performance. The objective is to investigate routes between cause and effect using basic emotion psychology concepts, and with specific reference to Plutchik’s Wheel of Emotions, develop a practical, interpretive experiment system. The workshop is open to all creative disciplines and all skill levels. It is centred around a practical session, where participants respond to single emotion state terms using their chosen medium, then question possible carriers or motivators which led to their interpretations. The objective is to strengthen the dialogue between what we see, hear or feel, and how we react to this creatively. An opening lecture briefing introduces key theories of emotion along with tools and processes to aid in exploiting emotion based approaches as strategy. The participatory nature and subjective response sets generated from the practical mean that plenty of time will be allocated for discussion, as this sharing is where emotion-outcome routes become clearer and better understood. 2 – 3 hours: Programme as above. 1 hour: Taster session – a brief, practical introduction to the concept. Full day: As outlined above, with an extended practical session exploring a wider cross section of emotion states. Discussion is enhanced with an introduction to psychoevolutionary theories of emotion and social factors affecting the politics of emotion. Case studies from my own research in developing emotion state exercises (or vignettes) will highlight the uniqueness of each individual emotion’s character potential. Performance/Sharing: Post workshop performances and sharing of work can also be arranged. 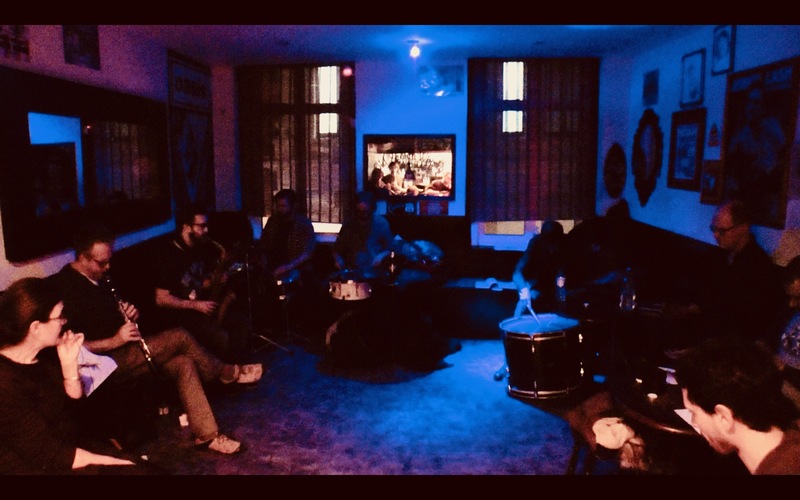 Venues and Specification: The workshop is open to academic institutions and community or special interest groups from all creative areas; space required is dependent on attendee numbers and the nature of participant disciplines; access to and/or space for a drum set is useful for demonstrations and participation during longer sessions. 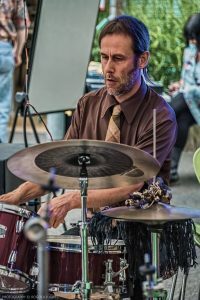 “I have always been fascinated by the more visceral aspects of performance and investigating the base, human elements of music making and listening – which I think comes from a deep seated need to express and communicate emotion. This workshop developed from an intensive period of research into solo drum set performance born solely from emotion-based motivators. The results were a real game changer for me and something I just had to share.” Lee Allatson. De Montfort University degree students get emotional with timpani, grand piano and toy instruments! 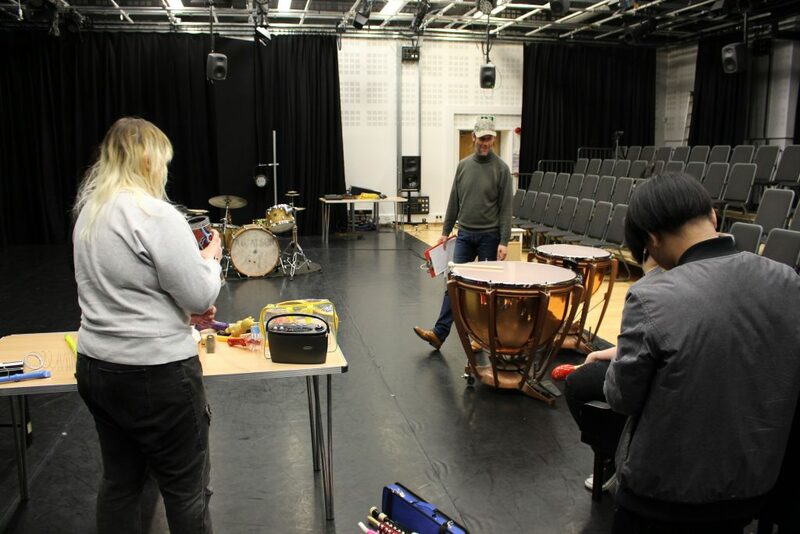 Surprise, Distraction and Amazement – DMU Degree Students, April 2018: Surprise used sparse, happy, playful bells and other small instruments alongside piano. The Q&A covered not only which sounds created the better sense of surprise, but also their rhythmic placement: abruptness was suggested as best communicating this. Particularly interesting in this discussion were comments about duration: do some emotions require (or stand) a longer or shorter performance length? Surprise is rarely experienced as a sustained or prolonged emotion state, so does this mean it is better communicated briefly/swiftly? Distraction brought physical performance into focus, with players moving in the space to create a visual sense of distraction for the audience; the debrief proposed developing unpredictable direction changes to this strategy. Amazement was delivered with bright, sparky, waves and bursts: Once again, this was discussed as a performance decision based on how we experience the emotion itself. Boredom, Disgust and Loathing – Guildhall School of Music and Drama, June 2018: Boredom opened with spacious, airy sounds converging to monotones and then dissonant droning; throaty yawns came from the vocal players with a definite move toward actively creating annoyance through fidgety, rhythmic kicking and even some forced snoring! Discussion responses brought childhood memories of minds wandering while sat on a school bench; boredom as feeling static – staying in one place and exhaustively tolerating a situation. Disgust was immediately more abrupt: highly broken, spitty, discordant, and of shorter duration. “Eurgh!” reigned in upchuck gestures, repelling, with sound used as weaponry. Loathing attacked in strong waves: blocks, screams, minor and confused. Discussion saw Loathing as an active obsession: unchanging, pushing away; a more social and personal condition. Mopomoso Workshop Group getting emotional in the moody blue setting of Troy Bar, London. Serenity, Joy and Ecstasy – Mopomoso Workshop Group, March 2018: Serenity fell into a very natural, gently rhythmic and enveloping chordal improvisation, with some wonderful instinctive harmony created from this relatively large ensemble. Serenity was suggested to be “something we have to find” during the discussion. Joy had a hesitant start, but then bright, harmonious intervals; intense and celebratory bells and fanfares. “Joy should be unforced” was one response – the initial performance deemed to be perhaps too intense and insistent. Joy was discussed as a physicality which could get out of control. “It’s hard to be joyful” was a further comment, prefacing this group’s worry of parody: “Joy has musical baggage!”. If we re-termed Joy as ‘Happiness’ it becomes “…the greatest gift, that I possess…”! Or worse, plain Happy = Despicable Me! Ecstasy burst in with trills and rattles, and some ingeniously evocative tones generated through a baby-com; intense, high pitched and with freer waves of melody. This was summed up immediately after playing as “Serenity on steroids!” Themes of ‘speaking in tongues’ were discussed and Ecstasy as an emotion state “on the edge of pain”. Skronkfest 2018 workshop: It was great to see some familiar faces from previous workshops attending this presentation at Skronkfest, and also regulars from various other improvisation groups and sessions (Freedom, Guildhall School of Music and Drama, and the Mopomoso Workshop Group, as well as Skronk). This was an edited, super-quick-fire taster to the I am Just a Little Emotional concept and so my preamble felt a little rushed, but we got successfully stuck-in to the playing in pretty short order – which is what it’s all about! We also enjoyed the added benefit of a dancer in today’s group, which certainly enriched the ensemble direction and opened discussion toward the more physical. I wanted to try a couple of different approaches in this session as part of the core mandate is to evaluate and question any common emotion approach traits in what we hear/see/feel, and consequently how we react to these. My proposal is that there are emotion routes less travelled – the curious cousins of the emotion family – where new territory for interpretation might be more rich, and it is these outer reaches I wanted to investigate today. Another workshop strategy to try was a suggestion from attendee feedback: to open with, what might be considered to be, an accessible, well trodden emotion path to communicate, by way of a warm up example and to create a template for the playing and discussion. Lee Boyd Allatson is a drum set player, sound artist and educator based in Leicestershire, UK. 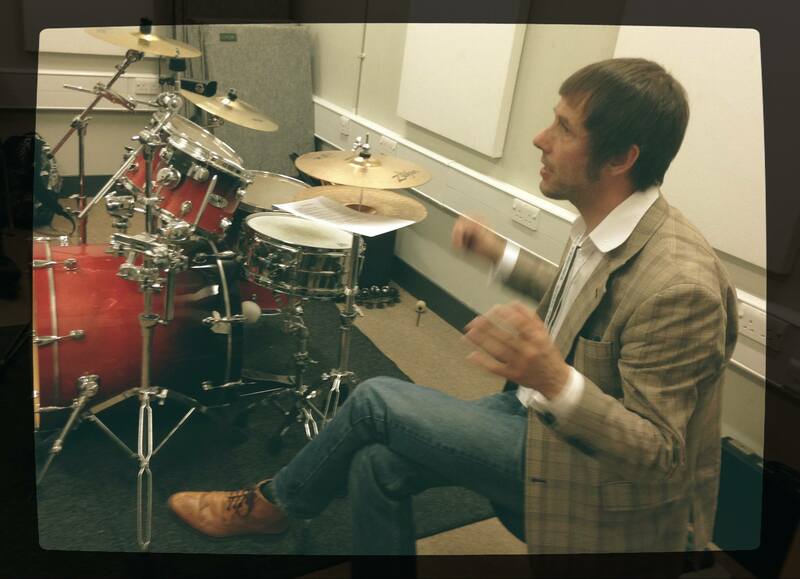 He has led workshops for Brickworks/Room for Music, De Montfort University, Guildhall School of Music and Drama, Leicester College, Liverpool Hope University, Mopomoso Workshop Group, plus a host of schools and community/specialist music groups. He has worked with, amongst others: Damo Suzuki (Can), Bill Drummond (The 17), Paul Dunmall, John Russell, Alan Wilkinson, Hannah Marshall, Tim Harries, Mark Sanders, Orphy Robinson, Walt Shaw, Eddie Prevost, Stuart Wilding, Bruce Coates, Christopher Hobbs, Shih-Yang Lee, Liu Fang-Yi (Kandala Records) and Wildbirds & Peacedrums. He is also founder and coordinator of the South Leicestershire Improvisors Ensemble and co-directer of the Near Miss Company (Associate Artists of De Montfort University, Leicester).